Verma, R. K., Lu, F. and Lu, Q. (2017). Glioma Induction by Intracerebral Retrovirus Injection. Bio-protocol 7(14): e2404. DOI: 10.21769/BioProtoc.2404. Glioblastoma (GBM) is the most common primary brain cancer in adults and has a poor prognosis. It is characterized by a high degree of cellular infiltration that leads to tumor recurrence, atypical hyperplasia, necrosis, and angiogenesis. Despite aggressive treatment modalities, current therapies are ineffective for GBM. Mouse GBM models not only provide a better understanding in the mechanisms of gliomagenesis, but also facilitate the drug discovery for treating this deadly cancer. A retroviral vector system that expresses PDGFBB (Platelet-derived growth factor BB) and inactivates PTEN (Phosphatase and tensin homolog) and P53 tumor suppressors provides a rapid and efficient induction of glioma in mice with full penetrance. 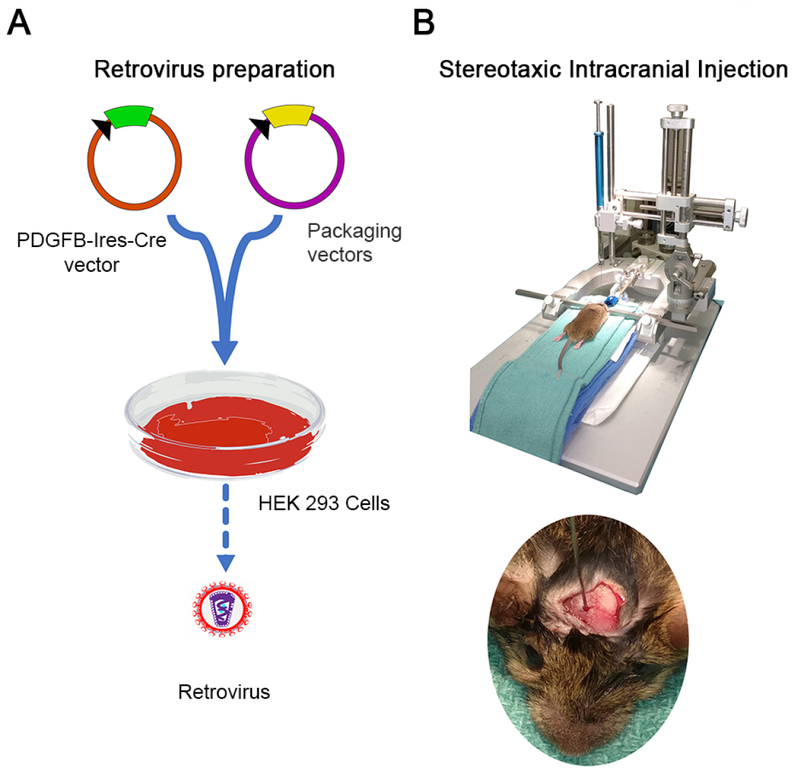 In this protocol, we describe a simple and practical method for inducing GBM formation by retrovirus injection in the murine brain. This system gives a spatial and temporal control over the induction of glioma and allows the assessment of therapeutic effects with a bioluminescent reporter. Glioblastoma (GBM) is the most aggressive malignant brain tumor and unfortunately is also almost always fatal. Despite advances in multiple therapeutic modalities, no effective therapy has been developed to cure GBM. The mechanisms underlying this disease remain poorly understood. Animal models have been a very important tool to define the GBM pathogenesis and test for gene or drug therapeutics. Several mouse models have been developed with the aim to produce a disease which mimics the human disease as closely as possible and exhibits similar molecular, genetic and histological character. The prominently used models are xenograft (Hingtgen et al., 2008) models where human tumor cell lines can be transplanted orthotopically in brain as well as ectopically in subcutaneous area in immunocompromised mice, providing an advantage of having a large tumor mass in a brief period. Genetically engineered mice models (GEMM) with specific gain-of oncogenic activities or loss of tumor suppressor pathways, which resemble perturbations in the most frequently dysregulated pathways in GBM, results in formation of gliomas in rodents. Genetic perturbations in GEMM models often include the gain-of-function mutations in oncogenic factors such as EGFR, PI-3K, and Ras (Holland et al., 2000; Zhu et al., 2009), and PDGF amplification (Assanah et al., 2006), as well as the loss-of-function in tumor suppressors such as NF1 (Zhu et al., 2005), TP53 (p53) (Zheng et al., 2008), Ink4a/ARF (Holland, 2001), PTEN (Holland et al., 1998 and 2000). The use of viral vectors (Ikawa et al., 2003; Hambardzumyan et al., 2009; Marumoto et al., 2009; Friedmann-Morvinski et al., 2012) such as retrovirus, lentivirus and adenovirus carrying oncogenes and/or targeting tumor suppressors has been a convenient and effective approach to induce brain tumor formation in rodents. There is a need for testing multiple different tumor models for therapeutics since different subtypes of gliomas have varied genetic profiles and clinical responses to drug treatment. GBM have been classified into four subtypes depending upon their gene expression pattern and molecular signature, namely, Mesenchymal, Neural, Proneural and Classical tumors (Verhaak et al., 2010). The Proneural subtype of GBM predominantly involves mutations/loss in oncogene P53 and amplification of PDGFRα with loss of PTEN seen across all the subtypes (Verhaak et al., 2010; Lei et al., 2011). To closely imitate the human Proneural subtype, Lei et al. (2011) devised a GBM model by inducing PTEN and P53 deletion and PDGFBB overexpression in the progenitor cells of the white matter region of adult murine brain through retrovirus inoculation (Lei et al., 2011). We have successfully used this retrovirus-induced GBM model in mice ranging in age from day 2 to 3-month-old adult mice with remarkable reproducibility (Lu et al., 2016). This model develops gliomas with full penetrance within 3-4 weeks which in contrast to other GEMM models, which take a significantly longer time. Note: We use a two-vector system for retrovirus production. One is a retroviral vector carrying PDGFB-IRES-Cre, which overexpresses PDGFB and Cre, and another is a retroviral packaging plasmid, which provides gag, pol and env to produce VSV-G pseudotyped retrovirus. We use commercially available DNA transfection reagents for 293T HEK transfection to produce the retrovirus. These mouse stains were crossed with a reporter line Rosa-tmLuciferase (THE JACKSON LABORATORY, catalog number: 005125 ) which has a firefly luciferase gene inserted at the ROSA26 locus (Durkin et al., 2013). This bioluminescent reporter will help to track the tumor growth and evaluate candidate therapeutic regimens. The mice were maintained on a mixed C57Bl/6; 129Sv; CD-1 background. Obtain appropriate animal use protocol from Institutional Animal Care and Use Committee (IACUC) before the animal work. Figure 1. Schematic of the whole procedure. A. Viral packaging and concentration; B. Stereotaxic intracranial injection of virus for induction of glioma. Note: We follow the manufacturer provided protocol for Polyjet mediated transfection (http://signagen.com/DataSheet/SL100688.pdf). Plate 293T cells (around 3-4 x 106) in poly-L-lysine coated 10 cm diameter dishes in DMEM with 10% FBS media (D10 culture media). Cells will become 70-80% confluent after 24 h.
Note: Plan accordingly to allow 5-6 h next day for transfection and medium change. Check for confluence next day and use the plates with 70-80% cell confluence. Note: Higher confluence can be a hindrance as cells don’t have space to grow. 1 h before transfection, change media with fresh D10 media–4 ml per plate. Use the following table for 10 cm plates for transfection (Table 1). Mix the calculated concentration of DNA in 500 µl DMEM without FBS and gently mix. Add 45 µl of Polyjet in 455 µl of serum free DMEM media and gently mix with pipette and immediately mix with diluted DNA of step A2b i. Gently mix them and incubate at room temperature for 10-15 min. Note: Not more than 20 min. Then add it into the plates drop wise and gently shake. Incubate at 37 °C and 5% CO2 for 5 h.
Note: Do not keep longer as it can be toxic to the cells. Discard the transfecting media and add fresh D10 10 ml per plate and incubate at 37 °C and 5% CO2 for 24 h.
Collect the media and centrifuge at 600 x g (2,000 rpm) for 10 min and collect supernatant, leaving the cellular debris at the bottom. Collected media can be stored at 4 °C for 3 days at max (Tiscornia et al., 2006) before ultracentrifuge concentration. Add fresh D10 media 10 ml per plate and incubate again for next 24 h.
Collect the media and centrifuge at 600 x g (2,000 rpm) for 10 min and collect the supernatant, leaving the cellular debris at the bottom. Pool the media from day 3 and day 4 and filter using 0.45 µm pore size filter. We use Beckman Coulter rotor SW 32 Ti, which has capacity to hold six 38 ml open-end tubes. Balance the tubes to the maximum difference of 0.5 g and centrifuge at 68,300 x g (20,000 rpm) for 2 h at 4 °C. With each tube holding 30 ml, a total 360 ml of media can be centrifuged in one run. If required to run more media, discard the supernatant after 1st spin without disturbing the pellet add fresh media for 2nd run. Note: Do not use the tubes filled less than half of its capacity which increases the risk of collapse. Pour off the supernatant after the run and aspirate rest of the droplets from the wall without disturbing the pellet. Transfer the centrifuge tubes in to 50 ml screw capped tubes and keep them upright on shaker at 4 °C overnight and allow the residual media to re-suspend pellet (roughly around 20-30 μl/tube). Centrifuge briefly and collect the re-suspended pellets from all the tubes, aliquot the concentrate in 4-10 μl volumes and store at -80 °C for more than a month. Avoid repeated cycles of thawing and freezing that can drastically reduce the viral titer. For in vivo injection, further purification of virus by sucrose cushion is recommended (Tiscornia et al., 2006). Collect the viral concentrate after overnight shaking and wash the tube with 100 µl of HBSS and pool it with collected viral concentrate. Using round bottom 5 ml tubes, fill it with 1.5 ml of 20% sucrose in HBSS and add 200 μl of viral concentrate. The rotor used is SW 55 Ti and after balancing, spin at 48,600 x g (20,000 rpm) for 2 h at 4 °C. Pour off the supernatant and allow rest to drain off by inverting the tubes. Re-suspend the pellet in 50-100 μl of HBSS, cover with Parafilm and shake slowly for 20-30 min. Collect the concentrate, aliquot it and store at -80 °C. Check for the titer in a reporter cell line. We use mouse embryonal fibroblasts, which express tdTomato reporter upon Cre expression. MEF (mouse embryonic fibroblasts) cells are isolated from E13.5-14.5 embryos of CAG-Rosa-tdTomato reporter mice (THE JACKSON LABORATORY) (Durkin et al., 2013) for retrovirus titering. These cells express tdTomato when exposed to Cre-expressing viruses and allowing us to assess the viral infectivity. For virus titration, we use the procedure described by Tiscornia et al. (2006). Coat the 24-well plate with 500 µl poly-L-lysine per well with incubation at 37 °C for 30 min, aspirate the media and wash with autoclaved deionized water and let it dry for 1-2 h in biosafety hood. Plate 105 MEF cells in 500 µl D10 media per well in 24-well plate. Use a minimum of 8 wells including one as negative control. Incubate it for 6 h and then check after 6 h if they adhere to the plate. Make 10-fold dilutions of retrovirus (undiluted to 106) in PBS with total volume around 50 µl. Change 480 µl D10 media with polybrene at a concentration of 4 µg/ml. Add 20 µl of each viral dilution to the well and mix gently and thoroughly. Incubate the cells at 37 °C for 48 h. TdTomato will be visible within 24-48 h.
Viral titer ≥ 107/ml is adequate for tumor formation. Note: Neonatal or young adult mice can also be used with appropriate stereotaxic device adapter. Switch on the incubator or heating pad. Check the micro-drill, anesthesia machine for oxygen pressure and adequate isoflurane flow and overhead light source. Set up the stereotaxic instrument as per the instructions of the manufacturer. Switch on the anesthesia machine with attachment for mouse enclosure. Oxygen flow (0.8-1.5 L/min) and isoflurane (2-3%) are set for induction of anesthesia and decreased to 1-1.5% for maintenance. Alternatively, use ketamine and xylazine combination which is injected intra-peritoneal. Load the concentrated virus in syringe (e.g., 3 µl per each mouse to be injected) slowly avoiding bubbles and set it up on the holder in stereotaxic device. Apply artificial tear ointment on exposed cornea to avoid drying. Anesthetize the mouse and check the anesthesia level by toe pinch. Set up the mice on stereotaxic device with nose and ear holders firmly to avoid any accessory movement of head during the procedure and isolate the surgical area with sterile drape or covers. Clean the operative area (back of the skull) using autoclaved cotton tips with chlorhexidine and isopropanol alternatively three times each. Wait for a few minutes. Make an incision on the back of head of about 1-1.5 cm in length to expose bregma. Adjust the stereotaxic device in relation to bregma as a reference and then use the coordinates depending on the age and area of brain to be targeted (e.g., for targeting the corpus callosum in adult mice, we used the coordinates: Anteroposterior + 0.2 mm, Lateral ± 0.5 mm and dorso-ventral 2.2 mm. Mark the targeted area with surgical site marker. Drill hole in bone using micro-drill being careful to avoid going too deep. Lower the syringe needle 0.4-0.6 mm deeper to the desired depth (e.g., here 2.2 + 0.6 mm), wait for 1-2 min and retract back to desired depth to form a small pocket and slowly inject 1 μl of viral concentrate, wait for 1-2 min, retract 1 mm and inject 1 μl again. We usually inject 1-3 μl of viral concentrate in one adult mouse. Slowly retract the needle to avoid leaking of the concentrate. After complete retraction, use tissue glue to join the tissue flaps. Keep the mouse on heating pad or incubator till it becomes conscious. Monitor the mice for next 2-3 days and administer analgesics as per the protocol. Wash the needle with 70% ethanol and three times with sterile water. The initial tumor growth can be noticed within 2-3 weeks in the brain monitored by in vivo bioluminescent imaging system such as IVIS Spectrum CT (PerkinElmer). Tumor-bearing mice normally survive for 3-6 weeks post injection depending on age at the time of injection. Neonatal mice injected at age postnatal day 2 (P2) to day 4 (P4) (48-96 h) tend to survive longer and develop a larger tumor, possibly due to the expansion of non-fused calvarial bones. The brain sections are stained with hematoxylin and eosin and tumors observed are typically invasive and hypercellular with hyperchromatic nuclei, foci of palisading necrosis and microvascular proliferation suggestive of glioblastoma (Figure 2). Figure 2. H&E histology of tumor sections. A. Sections showing tumor growth in the brain (Dotted line enclosure); B. Section showing typical features of glioblastoma-palisading necrosis (yellow arrow) and microvascular proliferation (blue arrowheads). Scale bars in (A) 1 mm and (B) 50 µm. Use only healthy and low passaged 293T or 293FT cells for virus packaging. Do not use filter smaller than 0.45 µm for the risk of shearing effect on viral particles. This work was supported in part by grants from the US National Institutes of Health NS078092 and R37 NS096359 to QRL. Assanah, M., Lochhead, R., Ogden, A., Bruce, J., Goldman, J. and Canoll, P. (2006). Glial progenitors in adult white matter are driven to form malignant gliomas by platelet-derived growth factor-expressing retroviruses. J Neurosci 26(25): 6781-6790. Durkin, M. E., Qian, X., Popescu, N. C. and Lowy, D. R. (2013). Isolation of mouse embryo fibroblasts. Bio Protoc 3(18). Friedmann-Morvinski, D., Bushong, E. A., Ke, E., Soda, Y., Marumoto, T., Singer, O., Ellisman, M. H. and Verma, I. M. (2012). Dedifferentiation of neurons and astrocytes by oncogenes can induce gliomas in mice. Science 338(6110): 1080-1084. Hambardzumyan, D., Amankulor, M. N., Helmy, Y. K., Becher, J. O. and Holland, C. E. (2009). Modeling adult gliomas using RCAS/t-va technology. Transl Oncol 2(2): 89-95. Hingtgen, S., Ren, X., Terwilliger, E., Classon, M., Weissleder, R. and Shah, K. (2008). Targeting multiple pathways in gliomas with stem cell and viral delivered S-TRAIL and Temozolomide. Mol Cancer Ther 7(11): 3575-3585. Holland, E. C. (2001). Animal models of cell cycle dysregulation and the pathogenesis of gliomas. J Neurooncol 51(3): 265-276. Holland, E. C., Celestino, J., Dai, C., Schaefer, L., Sawaya, R. E. and Fuller, G. N. (2000). Combined activation of Ras and Akt in neural progenitors induces glioblastoma formation in mice. Nat Genet 25(1): 55-57. Holland, E. C., Hively, W. P., DePinho, R. A. and Varmus, H. E. (1998). A constitutively active epidermal growth factor receptor cooperates with disruption of G1 cell-cycle arrest pathways to induce glioma-like lesions in mice. Genes Dev 12(23): 3675-3685. Ikawa, M., Tanaka, N., Kao, W. W. and Verma, I. M. (2003). Generation of transgenic mice using lentiviral vectors: a novel preclinical assessment of lentiviral vectors for gene therapy. Mol Ther 8(4): 666-73. Lei, L., Sonabend, A. M., Guarnieri, P., Soderquist, C., Ludwig, T., Rosenfeld, S., Bruce, J. N. and Canoll, P. (2011). Glioblastoma models reveal the connection between adult glial progenitors and the proneural phenotype. PLoS One 6(5): e20041. Marumoto, T., Tashiro, A., Friedmann-Morvinski, D., Scadeng, M., Soda, Y., Gage, F. H. and Verma, I. M. (2009). Development of a novel mouse glioma model using lentiviral vectors. Nat Med 15(1): 110-116. Tiscornia, G., Singer, O. and Verma, I. M. (2006). Production and purification of lentiviral vectors. Nat Protoc 1(1): 241-245. Verhaak, R. G., Hoadley, K. A., Purdom, E., Wang, V., Qi, Y., Wilkerson, M. D., Miller, C. R., Ding, L., Golub, T., Mesirov, J. P., Alexe, G., Lawrence, M., O'Kelly, M., Tamayo, P., Weir, B. A., Gabriel, S., Winckler, W., Gupta, S., Jakkula, L., Feiler, H. S., Hodgson, J. G., James, C. D., Sarkaria, J. N., Brennan, C., Kahn, A., Spellman, P. T., Wilson, R. K., Speed, T. P., Gray, J. W., Meyerson, M., Getz, G., Perou, C. M., Hayes, D. N. and Cancer Genome Atlas Research, N. (2010). Integrated genomic analysis identifies clinically relevant subtypes of glioblastoma characterized by abnormalities in PDGFRA, IDH1, EGFR, and NF1. Cancer Cell 17(1): 98-110. Zheng, H., Ying, H., Yan, H., Kimmelman, A. C., Hiller, D. J., Chen, A. J., Perry, S. R., Tonon, G., Chu, G. C., Ding, Z., Stommel, J. M., Dunn, K. L., Wiedemeyer, R., You, M. J., Brennan, C., Wang, Y. A., Ligon, K. L., Wong, W. H., Chin, L. and DePinho, R. A. (2008). p53 and Pten control neural and glioma stem/progenitor cell renewal and differentiation. Nature 455(7216): 1129-1133. Zhu, H., Acquaviva, J., Ramachandran, P., Boskovitz, A., Woolfenden, S., Pfannl, R., Bronson, R. T., Chen, J. W., Weissleder, R., Housman, D. E. and Charest, A. (2009). Oncogenic EGFR signaling cooperates with loss of tumor suppressor gene functions in gliomagenesis. Proc Natl Acad Sci U S A 106(8): 2712-2716. Zhu, Y., Guignard, F., Zhao, D., Liu, L., Burns, D. K., Mason, R. P., Messing, A. and Parada, L. F. (2005). Early inactivation of p53 tumor suppressor gene cooperating with NF1 loss induces malignant astrocytoma. Cancer Cell 8(2): 119-130. How to cite: Verma, R. K., Lu, F. and Lu, Q. (2017). Glioma Induction by Intracerebral Retrovirus Injection. Bio-protocol 7(14): e2404. DOI: 10.21769/BioProtoc.2404.